The man accused of killing 11 people at a synagogue in Pittsburgh reportedly left messages on a small social media service. 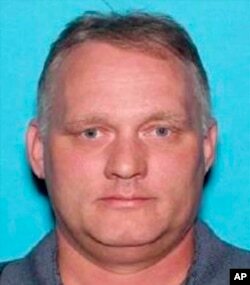 The suspect, Robert Bowers, was charged with 29 crimes, including hate crimes, related to the attack at the Tree of Life synagogue in Pittsburgh, Pennsylvania. The attack on the Jewish religious center also injured at least six others, including four police officers. On the morning of the shooting, a person using the name of Robert Bowers posted an anti-Semitic message on a social media service called Gab. The message targeted a Jewish nonprofit group called HIAS. The group seeks to help refugees around the world. Officials said Bowers called out "All Jews must die," before he fired at people inside the synagogue. The Southern Poverty Law Center is a nonprofit civil rights group. It said an examination of the suspect’s social media activity on Gab showed he had posted or reposted content at least 68 times. It said the postings often dealt with “numerous anti-Semitic conspiracy theories” long publicized by neo-Nazi and white nationalist groups. By Monday, Gab was no longer available on the internet after several companies supporting the site cut off services for policy violations. The Gab service was launched in 2016 by Andrew Torba. He said his purpose was to provide another social media choice for people facing restrictions by other services. The site gained popularity as Twitter and Facebook sought to ban members of a movement known as the “alt-right.” The alt-right is a far-right movement that publicizes extreme ideas -- mainly on the internet. Twitter, Facebook and other social media have said bans are carried out when users violate policies against hate speech or threats of violence, not because of their political views. The company that hosted the site, GoDaddy, said it decided to end its service because Gab had violated a policy against promoting violence. Payment company PayPal also banned Gab from using its services. Apple and Google blocked app sales of Gab for violating hate speech policies. In an interview published Tuesday on the internet, Torba said he was “horrified” when he learned the shooting suspect had used Gab. He said Bowers clearly violated a company policy that bans “threats of violence and terrorism.” But Torba said he did not know about Bowers or his postings until after the attack. In a statement, Torba called the actions against his site and new criticism after the Pittsburgh shooting unfair. He says the site simply aims to “defend free expression” for all individuals. “Social media often brings out the best and the worst of humanity,” his statement said. He added that he was working to find new partner companies to support the service so it can return to the internet. “Gab isn’t going anywhere,” he wrote. Other sites known to be popular with alt-right groups are 4chan and Reddit. These sites both have areas where members can read and post political views. Oren Segal is the director of the Anti-Defamation League’s Center on Extremism. He told Yahoo News his organization has already observed internet discussions among extremists about what will happen if Gab goes away forever. He said it is highly likely that another service sharing Gab’s views on uncensored speech would take over. Bryan Lynn wrote this story for VOA Learning English, based on reports from the Associated Press, Reuters and other online sources. Mario Ritter was the editor.